Multigranulation decision-theoretic rough sets (MDTRS) is a workable model for real-world decision making. The fruitful research achievements of the use of these models have been reported in different aspects. In most existing optimistic MDTRS models, the lower and upper approximations are defined based on the strategy seeking commonality while preserving differences, while pessimistic MDTRS models based on the strategy Seeking commonality while eliminating differences in the definitions of approximations. But in real life, one may need different strategies in defining lower approximation and upper approximation. 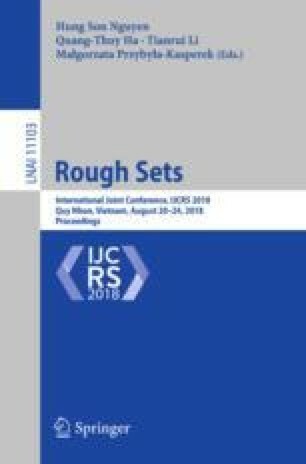 This paper defines a new MDTRS approach in the frameworks of multi-covering approximation spaces by using different strategies in defining lower and upper approximation, namely, covering-based optimistic-pessimistic multigranulation decision-theoretic rough sets. We first explore a number of basic properties of the new model. Then, we elaborate on the relationship between the proposed models and the existing ones in literature and disclose the interrelationships of the new models. This work was supported by the China National Natural Science Foundation of Science Foundation under Grant Nos. : 61663002, 61741309, 61403329, 61305052 and Jiangxi Province Natural Science Foundation of China under Grant No. : 20171BAB202034.